Where the island and the land are joined, the beautiful town of Sestri Levante was founded. The history of Segesta Tigulliorum – this is the toponym, from which the current name probably derives – is very long. It dates back to 2800 BC. Both Etruscans and Romans crossed its lands. In the 16th century it already had today’s name after being Siestri in Petrarch’s ‘Africa’and in Dante’s ‘Purgatorio’. 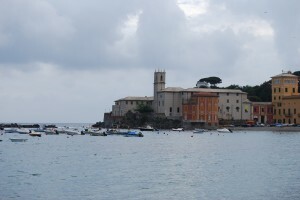 The Gothic-Romanesque church of S. Nicolò was already over 100 years old and was built on the peninsula separating the two gulfs, which people from Sestri, even today, still obstinately call ‘Island’. This charming Romanesque building can be reached if you climb up along a paved road. On the contrary, if you move along Via Matteotti, you can reach Via XXV Aprile, the ancient alley which unwinds through clothes shops, small restaurants and Renaissance buildings with beautiful street doors decorated with sculpted slate friezes along the walls of the gardens of the erstwhile Palazzo Brignole, now Balbi. So almost without noticing you will get to the bay of Silence, the favourite of the English poet Byron, which runs along a perfect sandy semicircle. It is hedged by two hinted jetties. One detaches itself from the peninsula, whilst the other is an extension of the rock coming down from the Mandrella hill. The landscape is completed by the beautiful promenade dedicated to the poet Descalzo and the two marinas.